Soviet leader Joseph Stalin died 60 years ago, on March 5, 1953. Stalin died of a stroke at his dacha in Kuntsevo, just outside Moscow. Yury Levitan, a Soviet radio announcer famous for his wartime, read from communique that the "Father of Nations" was dead. On March 6, the coffin with Stalin’s body was displayed at the Hall of Columns in the House of Trade Unions. People paid their last respects to Stalin for three days and three nights. 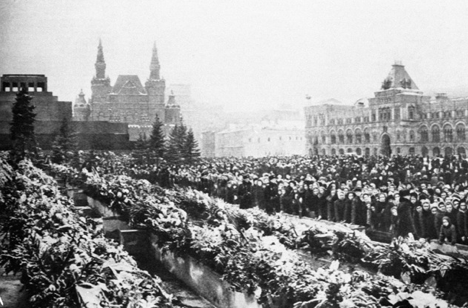 During Stalin’s funeral, wakes were held all over the country. On March 9, 1953 Stalin’s embalmed body was interred in the Lenin Mausoleum, which was called the Lenin – Stalin Mausoleum in 1953 to 1961.